Noonee® is a new Start Up company coming out of research in robotics in Switzerland. Aimed at solving healthcare problems within the manufacturing industry, noonee adopts a Chairless Chair® approach. Within the manufacturing industry, keeping employees healthy has been a major concern and challenge for many companies around the world for a long time. Jobs often involve spending long periods of time bending and crouching and as a result can leave staff with substantial back and knee problems. Of 215 million industry sector workers in the EU, a staggering 85 million are reported to suffer from muscle related disorders. Market solutions that are currently available may also pose problems as they limit short term tiredness by taking all the weight of the user, which can lead to muscle weakening. What is needed is a product that can support staff working on production lines while keeping them healthy. Coming out of NCCR Robotics lab, the Bio-Inspired Robotics laboratory at ETH Zurich, Switzerland, noonee® is a revolutionary start-up business aiming to address this significant social issue that previous solutions have not dealt with successfully. The idea is to provide an exoskeleton that supports the weight of the user only when they feel tired , rather than continuously taking on this weight – meaning that the wearer is using their muscles and actively, rather than passively, sitting. The “chair” is not a chair as we know it, but more of an exoskeleton for the legs with a belt to attach it to the hips and straps that wrap around the thighs. The slim structure has joints that allow the wearer to move freely, but when the wearer is in a position they wish to stay in for a long time (e.g. crouching under a car on a production line), this position can be fixed, meaning that the wearer does not need to use the same muscle groups for long periods of time to hold the position. The advantage of such a structure is that it can be worn anywhere and can also be used when standing and walking. This reduces the space required as compared to a traditional chair and reduces the hassle when compared to other solutions, such as chairs that are strapped to the user. The Chairless Chair® is currently still in prototype and the current version requires the user to fix a position by crouching down into the required position and pushing a button. 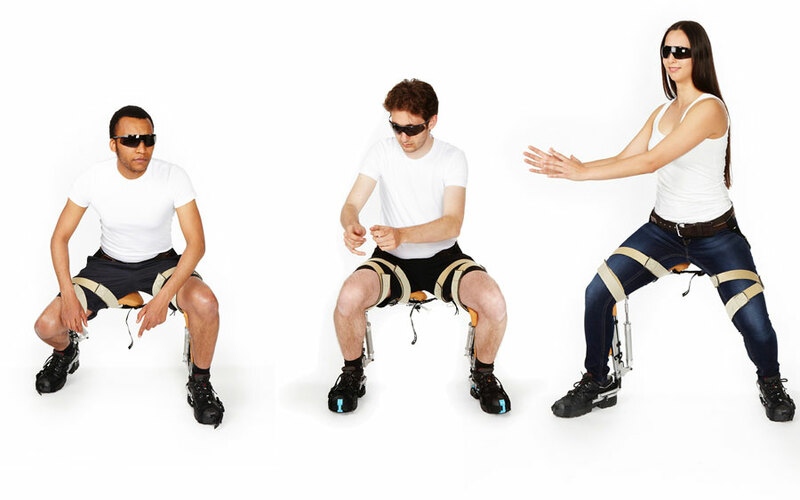 It is hoped that future iterations of the Chairless Chair® will be actuated to allow the system to become intelligent and understand the intention of the user, allowing it to be fixed into position without any additional input from the wearer. If you’re interested and want to be a part of prototype testing, check out their website and get in touch. Feel free to also ask questions in the comment section below.